Becky Albertalli’s YA novel Simon vs. The Homo Sapiens Agenda won the William C. Morris Debut Award, but the accolades don’t stop there. The book has been praised or recognized by everyone from ALA, Carnegie, Oprah and Lambda. Although this book has been on my shelf for a couple years, as soon as I knew the movie was coming out – I knew I had to read it…and I am soooo sorry I waited so long. Simon is a junior in high school. He lives with his younger sister, Nora, and his parents. His older sister, Alice, is away at college. Simon is all kinds of awesome. He’s funny, self-aware, smart and gay. The problem is that he hasn’t told anyone yet – about being gay. Everyone knows the other stuff. Well, there’s one person who knows Simon’s secret. His name is Blue. He and Simon have been exchanging emails and those emails are what set Simon’s story in motion. When he forgets to log out of his Gmail account at school, another kid, Martin, sees the emails and uses them to blackmail Simon into helping him hook up with one of Simon’s friends, Abby. It’s kind of a ridiculous premise, really, but let’s remember the cesspool that is high school. …the whole coming out thing doesn’t really scare me. I don’t think it scares me. It’s a giant holy box of awkwardness, and I won’t pretend I’m looking forward to it But it probably wouldn’t be the end of the world. Not for me. Simon’s blackmailer is “a little bit of a goober nerd”, but Simon doesn’t want to out Blue and so he does his level best to match make, but the problem is that Abby likes someone else, Nick, who is one of Simon’s best friends. And then there’s Leah, Simon’s other bestie, who may have feelings for Nick herself. It’s a tangled web, but maneuvering through these relationships is part of the high school experience. Watching Simon and Blue’s relationship unfold via their emails is really beautiful. Despite attending the same school, they don’t know each other’s true identity and so they speak freely about their insecurities and hopes. They fall in love without meeting and, I have to say, it’s pretty damn romantic. The other awesome thing about Simon vs. The Homo Sapiens Agenda is that it’s funny. Like laugh-out-loud funny. And also heart-felt without being schmaltzy. Even Martin has his moment of redemption. There are no bad guys in the story, but there are plenty of opportunities to learn (sans didactics). There’s no arguing with the fact that Ian McEwan is an astoundingly good writer. I have read enough of his books over the years to know that I like him, even when he’s hard work. (I have read Saturday, On Chesil Beach, and The Children Act Predating this blog I’ve read First Love, Last Rites, The Comfort of Strangers, The Cement Garden and my favourite McEwan novel, the devastating Atonement. I have a couple more on my tbr shelf.) McEwan is astonishingly prolific and you really never feel like you are reading the same book over and over. He has lots to say about a variety of topics and he says it well. That’s the saving grace of Nutshell, which was chosen as our book club selection this month. I did a little inward grown when Sylvie revealed this book. Not because it was McEwan – clearly that wouldn’t bother ne – but because I already knew about the novel’s conceit and I wasn’t really interested in reading this book. At all. But then: it’s McEwan. In less capable hands, this book would be a dog’s breakfast and instead it was, while not exactly enjoyable, an easy read. So here I am, upside down in a woman. Arms patiently crossed, waiting, waiting and wondering who I’m in, what I’m in for. My eyes close nostalgically when I remember how I once drifted in my translucent body bag, floated dreamily in the bubble of my thoughts through my private ocean in slow-motion somersaults, colliding gently against the transparent bounds of my confinement, the confiding membrane that vibrated with, even as it muffled, the voices of conspirators in a vile enterprise. That was in my careless youth. That’s the opening of Nutshell. If it’s not obvious, the narrator of McEwan’s book is an unnamed fetus. He’s sentient and trapped inside his mother’s womb. I say trapped because instead of biding his time until he’s born, he must listen to his mother, Trudy, plot with her lover, Claude, to kill Trudy’s husband, John. Matters are further complicated by the fact that Claude and John are brothers. If any of this sounds familiar, you know your Shakespeare. That’s all I’ll say about that. As the narrator contemplates his mother and her lover’s plans to kill John, he also waxes poetic on a variety of topics including philosophy, poetry, and the best wine. He might be stuck where he is, but remarkably (or maybe not remarkably: this is McEwan, after all) the plot moves along at the pace of a good page-turner. Careful readers will love the allusions and readers smarter than me will likely find the overall reading experience intellectually satisfying. Nutshell is classy fan fiction by a writer whose talent and intelligence are undeniable, but I wouldn’t have ever picked this book up on my own. Keira published three volumes of Diana, a smash hit with a huge cult-following, and then went off to college in the States. The Truth Commission‘s conceit is that Norm is writing her Spring Special Project, a story which covers three months from the previous fall (Sept-November). Here’s how the project is supposed to work: Each week I will write and submit chapters of my story to my excellent creative writing teacher. She will give me feedback on those chapters the following week. I will write as if I do not know what will happen next – as if I’m a reporter, which is a device used in classic works of non-fiction. Norm’s story is about The Truth Commission, a committee consisting of Norm and her best friends Neil and Dusk (aka Dawn) who “went on a search for the truth and…found it.” Norm discovers that the truth is a complicated thing and that is especially true in her own family. Highly recommended and BONUS! Canadian. This One Summer by cousins Mariko and Jillian Tamaki is a Governor General’s Literary Award winner in addition to being on several Best Of…lists. I can’t claim any real expertise when it comes to graphic novels, so I don’t really know what the criteria might be for determining what makes a graphic novel superior to others. Like everyone of my generation, I used to be a big fan of Archie and horror comics, but it’s only since I returned to the classroom that I have made it a point to read graphic novels – mostly because I do have students who enjoy them and I want to be sure that I include them in my classroom library. Rose and her family have been going to Awago Beach every summer since she can remember. Rose says, “My dad says Awago is a place where beer grows on trees and everyone can sleep in until eleven.” It’s magical. It’s also where Windy, Rose’s “summer cottage friend since I was five” lives. This summer is captured in monochrome as Rose and Windy revisit old haunts and settle back into their summer routine. It’s clear, though, that the one and a half year difference between the girls is impactful this year. Rose, the elder, is contemplative and watchful and often reacts to Windy’s suggestions with a shrug and a “maybe.” At Brewster’s “the only store in all of Awago” the girls buy penny candy, rent horror movies and watch (Windy with girlish disgust and Rose with curious fascination) the overtly sexual relationship between older teens Dunc and Jenny. This one summer is different in another way. Rose is hyper aware that her parents don’t seem to be getting along all that well and Rose senses the rift is sucking them all in even when her father assures her that “It’s all just adult junk that doesn’t mean anything.” It’s hard to navigate that tricky path from childhood to adulthood without touchstones and Rose is aware, perhaps without quite understanding it, that she is on shaky ground. This One Summer is a coming of age novel steeped in nostalgia. It will remind adult readers of their “one” summer, that time that now seems captured in a permanently dreamy gauze and it will ring true to young adults for whom that one summer may be this summer. This is us. Our pose. The smush. It’s even how we are in the ultrasound photo they took of us inside Mom…Unlike most everyone else on earth, from the very first cell of us, we were together, we came here together. That’s almost-fourteen-year-old Noah, one of the twins who narrates Jandy Nelson’s remarkable YA novel I’ll Give You the Sun. Alternating between Noah and his sister, Jude, who tells her part of the story at age sixteen, the novel traces the siblings’ journey from innocence to experience. Jude and Noah are artists who dream of getting into California School of the Arts (CSA). Their parents, both professors, are going through something neither understands. Noah observes “Dad used to make Mom’s eyes shine; now he makes her grind her teeth. I don’t know why.” The summer they turn fourteen, though, their world is rocked by tragedy. Jude and Noah are both eccentric as heck. Jude channels the spirit of her dead Grandma Sweetwine. She’s a self-proclaimed bible thumping klutz who is boycotting all boys because of a traumatic experience she had with Zephyr, the three-years-older than her surf god who “made [her] feel faint every time he spoke to [her].” Noah has his own issues. For one, he paints in his head – elaborate pictures that he’s never told anyone about, not even Jude when they were speaking. Then there’s Brian, the boy next door. And Noah’s strained relationship with his father who wants him to man up. When the unthinkable happens and Jude is accepted into CSA and Noah is not, the rift between the twins grows larger. It takes a long time before either realizes that the secrets they’d been keeping in an effort to protect each other were, in fact, part of the reason they were estranged. I’ll Give You The Sun is one of those amazing (and rare) YA novels that actually treats its target audience like they are intelligent (which as a high school teacher, I can tell you with certainty, they are). Everything from the novel’s narrative structure, to its examination of art, love, grief, jealousy, personal happiness versus personal responsibility, and family dynamics is designed to make you think and question. Jandy Nelson writes beautiful books (check out her first exceptional novel The Sky is Everywhere) peopled with flawed and totally sympathetic characters. That says nothing of the beautiful prose – resplendent language that spills out of every page. I’ll Give You The Sun is deserving of its copious praise and numerous awards. Jude and Noah will certainly stay with me in the days ahead. It’s been quite a while since I’ve had such a visceral reaction to a book. 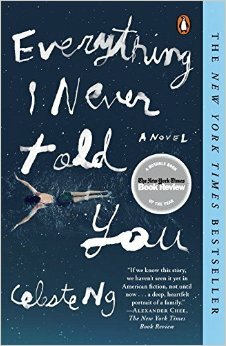 I read the bulk of Celeste Ng’s debut novel, Everything I Never Told You, on my snow day (a gift for a teacher, even if it’s only because we get to catch up on marking/yearbook/planning – and, yeah, reading). I don’t think I will ever be able to adequately explain how I feel about this book or these characters. Lydia is just sixteen when she is found at the bottom of the lake across the street from her home in small-town Ohio. It’s the 1970s, the decade in which I, too, was coming-of-age. On the morning she is discovered missing (and it is this “innocuous” fact that sets the story in motion) we see the Lee family dynamic. As always, next to her cereal bowl, her mother has placed a sharpened pencil and Lydia’s physics homework, six problems flagged with small ticks. Hannah, Lydia’s younger sister is “hunched[ed] moon-eyed over her cornflakes, sucking them to pieces one by one.” Lydia’s older brother, Nathan, is sitting on the stairs trying to wake up. James, their father, has already left for his job as a professor at the local college. Lydia is never late. She is never anything but compliant. She is a “yes” girl, the favoured daughter. It is only after her body is found that her story, and that of her family, begins to unravel. And yes, you will want to know what happened to Lydia, but trust me, it’s just one of the many things that will break your heart in this magnificent novel. Marilyn’s career plans are pre-empted when she gets pregnant. She and James marry and move to Ohio. Of course, their union wouldn’t be quite so problematic now (I’d like to think, but there are always some people…. ), but it’s the late 50s when they marry. Another world, another time. And life, fraught as it is, moves on. But why is it fraught? Because James grew up attending private school for free because his mother worked there as the cook and his father the janitor? Because he never fit in anywhere? Because Marilyn didn’t want the life her mother had? Because of dreams deferred? And what happens when our parents’ lives are complicated and damaged by their own childhoods? Ah, we all know the answer to that question, right? It all trickles down. Everything I Never Told You is an astounding, complex and heart-breaking look at the secrets we keep, not only from our families but from ourselves. Why we keep them, and the damage caused because of it, is just part of what happens in Ng’s book. The horrible longing we feel to crack ourselves open, the desire for true communication and intimacy, is another part. There wasn’t a single character in this novel I didn’t want to hug – I loved them all. That they were so fabulously human and fragile is a testament to Ng’s talent. Highly (times a billion) recommended.